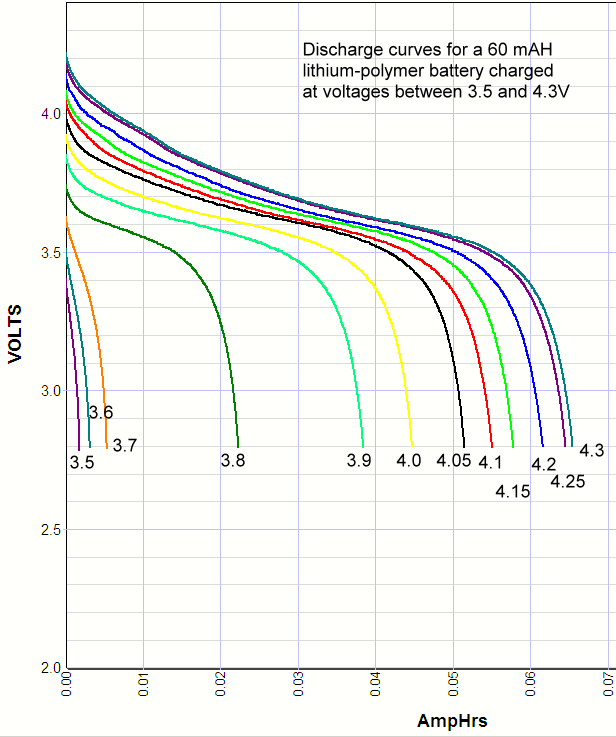 How does capacity correlate with charge voltage for lithium ion batteries? And evidence that cycle life is strongly dependent on charge voltage! With lithium-ion (lithium-ion, lithium polymer, lithium iron phosphate, etc.) this is not the case. There is a voltage below which there is no action, the chemistry just won't move. But a big part of the charging process is getting ions in and out of solid compounds. These compounds have space between the crystal planes, or within the crystal structure, for small ions, such as lithium, to insert themselves. But it takes force to drive them in, and the more force the more the loading of the crystal. This loading small atoms into a crystal structure is called intercalation. 1. I used a 60 mAH ultra-thin lithium polymer battery. This small capacity should be able to be charged and discharged quickly, it won't heat up, and if something bad happens it isn't able to store pressure, and doesn't have enough energy to do any damage. In addition I can tell if something is going wrong because the battery will start to puff up. But it never did during these tests. 2. Charging was done with a lab power supply, the voltage was set and the battery connected without regard for current limit. Typical starting currents were 60 to 100 mA at the higher voltages. 3. The battery was discharged at 100 mA rate to 2.8 volts termination voltage. Commentary: It looks like the magic number is around 3.8 volts. Below that you don't have significant charging, above that you do. A lithium ion battery doesn't care if it is never fully charged, so if all you have available is 3.8 volts and you don't mind the loss in capacity you could use the 3.8 volts. Unfortunately, the supply voltage is probably 3.3 volts in this modern digital age, which won't work at all. An interesting thing to notice is that the cycle life goes up at lower voltages, the equation is roughly Ef (Vch)= 2^[10*(4.2-Vch)] where Ef is the enhanced life cycle factor (Ef = 2 would mean that the battery will survive twice as many charge-discharge cycles as Ef = 1), and Vch is the charge voltage. 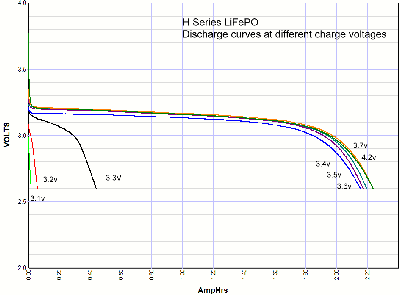 So, if you needed a battery that would give you 4800 to 8000 charge-discharge cycles down to 2.8 volts you could charge the battery at 3.8V and live with the 36% of the nominal capacity. A similar study using lithium iron phosphate cells for comparison.